So, chambray. Every blogger's go-to shirt. This is honestly a little bit of a "duh" post ("I already know how to wear chambray, Ashley!"). I haven't done a chambray round up on the blog before so I figured today would be the perfect day (aka a busy weekend means no new blog photos). Aaaaand I just love my old navy chambray! Let's take a look, shall we? (or the Canadian Tuxedo or whatever you want to call it). I love pencil skirts (even though they get wrinkly in a second - look at that skirt!) because they make you look instantly professional. 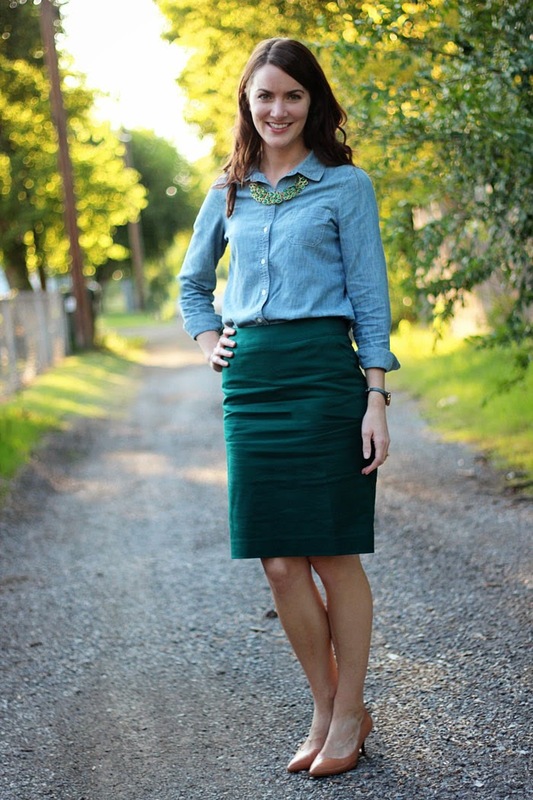 Chambray is a great compliment to a pencil skirt because it's dressy but not too formal. 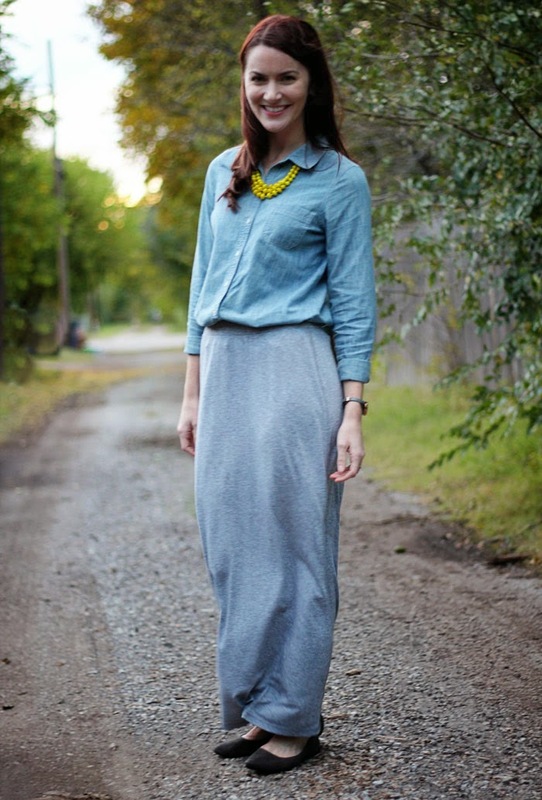 This maxi is kind of slouchy (it's essentially sweat pants material) but the chambray dresses it up a little. Sometimes bright patterns can be hard to wear, but somehow chambray always works! 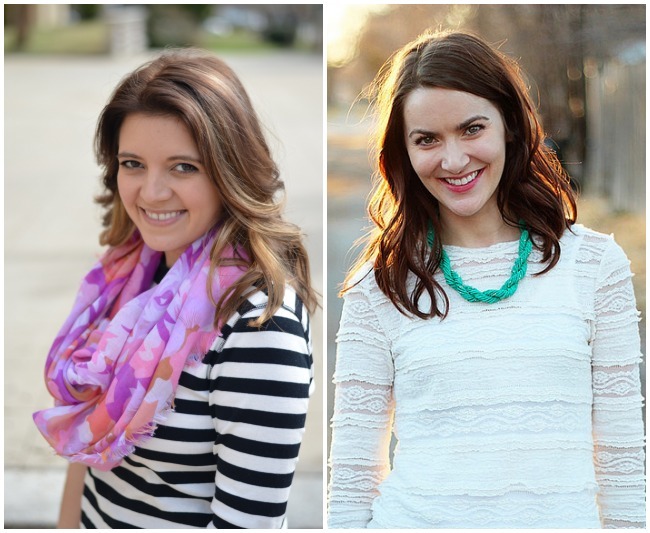 A big thank you to Lauren for letting me co-host this week's link-up. Link-up with us after the break! I love me some chambray! I love to pair my chambray tunic with leggings,flats, and a statement necklace. I love the idea of pairing it with a pencil skirt! You look so pretty in these lovely 4 looks. Chambray is one of my favorite item in my wardrobe which I wear maybe too much. Chambray is the best! I wear mine so much I caved and got a polka dot one! I am super excited to remix it, too! You pull off that Canadian tux really well. I love the color you added with the necklace. I will have to try that soon! 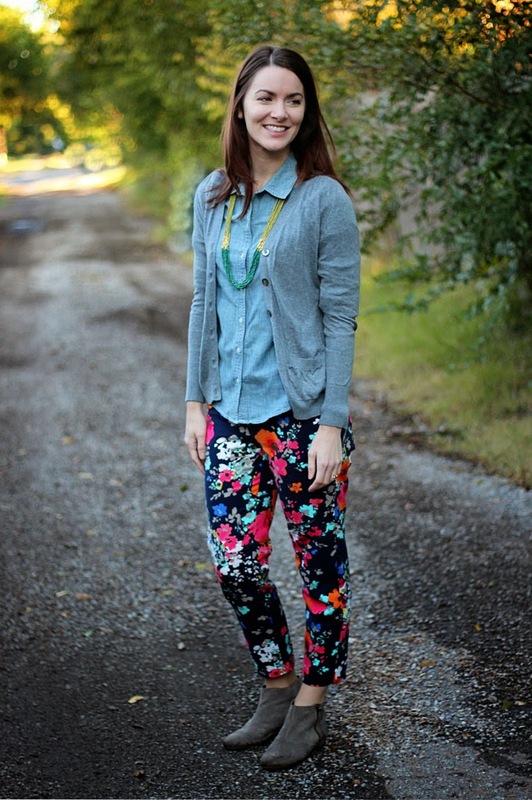 I love this post because I love my chambray ;) Seriously. I wear mine out like crrrazy. Haven't done it with a pencil skirt, though - it'll be fun to play around with that! I wish I owned a chambray :) soon hopefully. It's just hard to find one for a good price. I love seeing how other ladies style theirs. I love how you layered it with patterned leggings. Thanks for your comment. Yes! A chambray is the easiest to wear. Any time I'm having a hard time styling something, I just wear it with a chambray! You know I love this post because I've said I love all of these outfits before! Chambray is my fave! Fabulous! LOOOVVEE me some chambray. It is so easy to worth with and feels like wearing pajamas in public! Look two has given me some inspiration to wear my chambray to work. It really is my lazy weekend go to, but it's nice to see it dressed up different ways. How to wear Chambray? WITH EVERYTHING! I keep thinking I should buy another one, because I wear mine so often! Very cute, I honestly don't have any chambray! But it looks so versatile, I'll need to add some to my wardrobe! 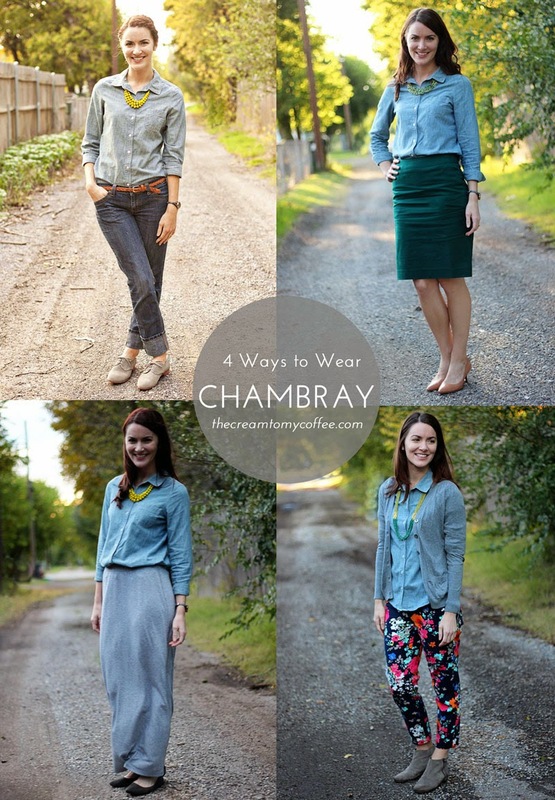 chambray is definitely my go to... love these looks! I don't own a chambray but I love the Texas Tuxedo outfit. Chambray seriously is a good half of my wardrobe. It is so versatile! It may seem like a "duh" sort of idea when you do figure it out, but when I got my first chambray, I had to lookup ways to wear it...so I think this is really helpful! Love that you're co-hosting because I just love your blog! :) Those floral pants are just perfect, by the way. Great minds think alike as I'm wearing my chambray shirt today also! I love how you showed 4 different ways to wear it. The layered with pattern is my favorite! These are all great looks! I probably wear my chambray shirt once a week. It just works with everything! The chambray is definitely a go to! I love it styled with the pencil skirt! I think that's my favorite way to wear it right now! I like seeing your ideas on how to wear this shirt. They all look great and it makes me think about ideas too. I love it with the green skirt, all of your choices look great! I like that you call it a "duh" post, but at the same time, I wear my chambray underneath sweaters and cardigans more often than I wear it by itself. Maybe I should take a page from your book and wear it on its own more often! yay for chambray! (and rhymes). My favorite is the one with the pencil skirt, I like the "business meets casual" vibe. Lookin' good, my friend. I totally think a chambray remix is necessary! For some reason, I am always looking for ways to wear mine and it doesn't get as much action as I thought it would- super cute looks! 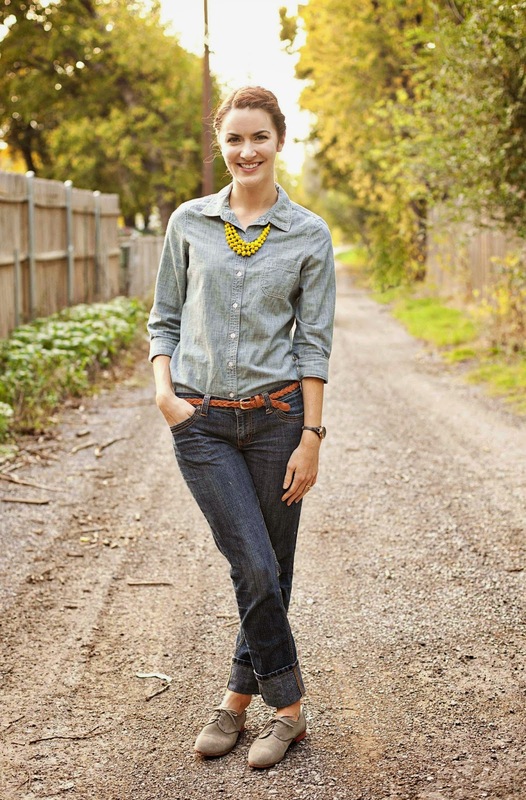 Hello Ashley...thanks for inspiring me to remix & restyle my chambray like you did here. I love how you did it & I will surely let you know when I do the same! I haven't hopped onto the chambray trend yet but you're post is convincing me! I was so happy to see you co-host first of all. And I love when you do your remix posts because even-though you always say you are not that much into fashion bla-bla-bla =D, your blog is very much a style blog (among other things) to me and I adore the way you dress. Just being honest, doll.